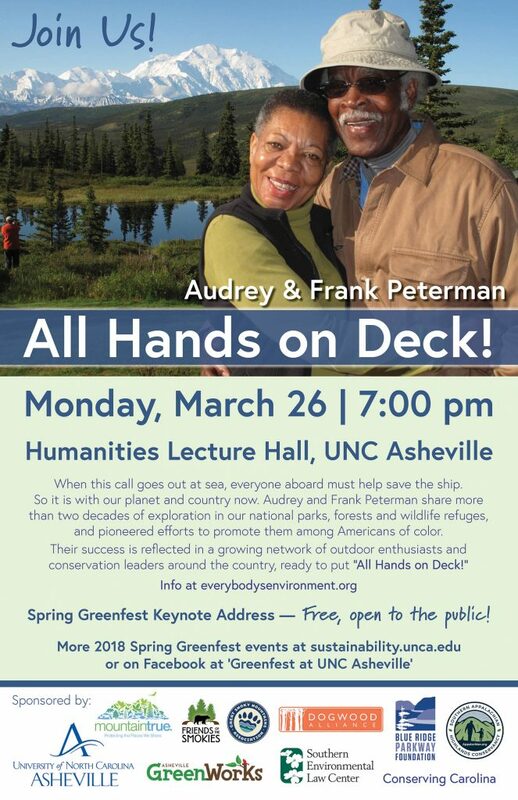 As the keynote for UNC Asheville’s 2018 Spring Greenfest and with the support of organizations from Everybody’s Environment, Audrey and Frank Peterman will give a guest lecture on Monday, March 26, 7:00 pm, in the Humanities Lecture Hall. This event is free and open to the public. When this call goes out at sea, it signals the vessel is in dire shape and no one any longer has the privilege of being a passenger. Everyone aboard must be actively engaged in helping save the ship. So it is with our planet and country now. With the accelerating effects of climate change meeting the bottomless well of denial, a cataclysm seems inevitable. No one any longer can afford to be a bystander. All Hands on Deck will share strategies on how to expand the constituency of Americans who prioritize our environment and publicly-owned lands, recognizing its fundamental value to our health and well-being. After the presentation, the UNCA Student Environmental Center will host a short discussion session in the lobby of Carmichael Hall, with light refreshments. Audrey and Frank Peterman have been pioneers in the green and conservation movement since 1995.They are among the leading experts on America’s publicly-owned lands system. They are tenacious advocates for breaking the color barrier and integration of our natural treasures as a way for all Americans, including children, youth, adults and seniors regardless of ethnic heritage to better appreciate our collective history and achieve a truly democratic society. 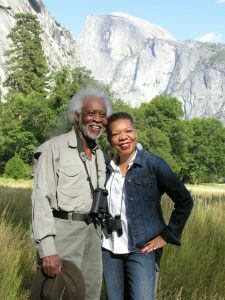 With their last child graduating from college, Audrey and Frank embarked on a road trip around the country to “discover America.” Traveling 12,000 miles across 40 states from Florida to Washington State, they were transformed by the stunning natural beauty, history and culture protected in our National Parks and forests. Shockingly, they saw less than a handful of Americans of Hispanic, Asian, African or Native American heritage enjoying the Great American outdoors, or working in them. Recognizing that this problem stemmed from a lack of information, misconceptions and latent fears about being in the woods, the Petermans resolved to become a catalyst for change. Since then, they’ve crisscrossed the country multiple times, visiting 156 national parks, numerous forests and wildlife preserves; served on a plethora of environmental boards; inspired hundreds of thousands to discover and support our national treasures, and personally taken thousands of Americans on tours of the national parks.